Welcome to Ice Hockey Australia! 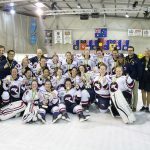 The Official Site of the Australian Ice Hockey Federation. Ice Hockey is one of the most exciting sports to play. If you want to learn to play Ice Hockey you will find more information here. IHWA have announced that the DeFris Championship will be held at the Cockburn Ice Arena, Perth. Dates for this championship are 31st July till 3rd August. IHWA are finalising the game schedule now and this will be published in the near future.